The Statue of Maharaja Sayajirao Gaekwad III seated on horse’s back is situated near Sayaji baug (Kamati baug)‘s Main Entrance. The Statue is of vigorous Bronze which was made by F Derwett Wood at cost of Rs. 60,000. It is the real size statue of Maharaja. The maharaja’s face is in eastern direction. The statue is of real height of the maharaja. It is also one of few statues of maharaja with their mustaches. There is also 6 foot long sword. 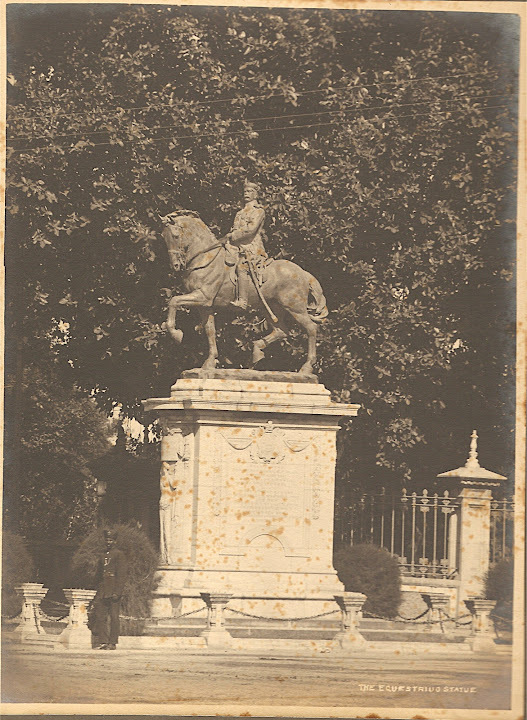 On 17th March 1907 – Maharaja Holkar of Indore visited Vadodara (Baroda) and unveiled an Equestrian Statue of Maharaja Sayajirao made by F Derwett Wood. The Statue was erected by public subscription in commemoration of Maharaja Sayajirao Gaekwad III. According to Texts written on statue’s rock, the Statue was unveiled on 5th March, 1907, during the silver Jubilee Celebration (Ropya Mahotsav) of Maharaja Sayajirao Gaekwad III. Roman lady is carved out from stone below the statue in 2 sides. Birthday & Reigning years are written in carved style. In other 2 sides, why this statue was made and placed is written in Marathi and Gujarati Language. The Statue is known as KalaGhoda as of Black Horse. The horse’s 2 legs are in the air, one on left side at Front and other one at right side at Rear. Note: The dates published in this post may or may not be perfect, as the statue also refers to wrong dates & years.